I have to admit, I am not the most excited person in the world when it comes time to sit down and make a grocery list for the week ahead. Planning weeknight meals that are quick, easy, and preferably healthy can be a challenge. 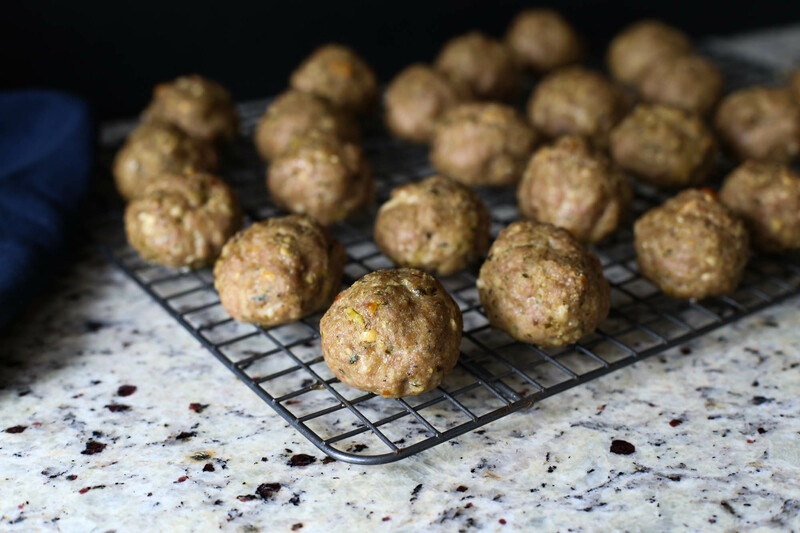 This recipe for baked pesto meatballs fits all of those categories, and it makes enough leftovers to last for lunch the next couple of days. 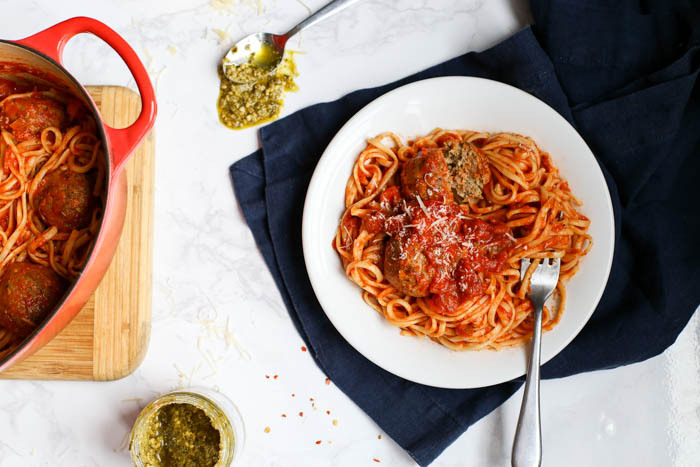 Spaghetti and meatballs has long been one of our trusted go-to family dinners, and now it has become even better with the addition of pesto. Large batched weeknight dinners are the real apple of my eye. The icing on my cake. 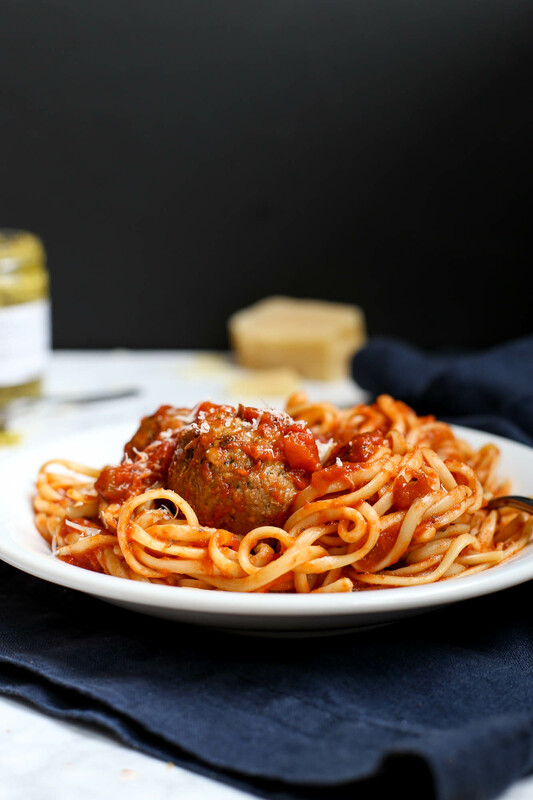 The spaghetti to my…meatballs. (See what I did there!?) In this recipe we add pesto to the meatballs for more flavor, and bake them in the oven instead of cooking them on the stove. Less sputtering and such; less standing over the stove. 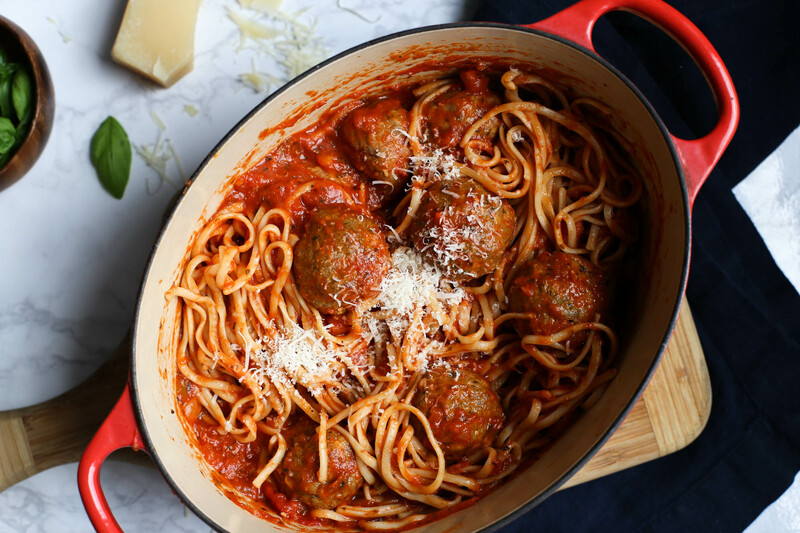 Toss the baked meatballs into a pot with your favorite sauce and spaghetti and you are good to go. This is a recipe I’ve made numerous times when visiting family – it’s great for feeding a lot of people, adults and kids alike. 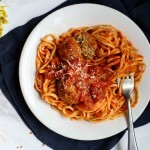 What I don’t tell them is that I use ground turkey in this meatball recipe to make it slightly healthier. Just like ground beef, turkey is available in different lean to fat ratios (such as 90/10). Ground turkey breast is the healthiest choice for less saturated fats and calories; simply check the labels when you’re buying it. My husband and I prefer the lean meat because it is better for keeping cholesterol levels low. On special occasions I still use a meatball mix of nice ‘n fatty ground beef and pork, but for regular weeknight family meals it’s ground turkey. Making the shift was easier than I thought, no flavor is sacrificed, and after all, healthy eating is about the small decisions we make every day. Pesto adds a lot of flavor to these baked meatballs, so much so that I can eat them on their own without sauce. Yes, without sauce. Seriously, without sauce. My parents probably don’t believe this claim, since I wouldn’t touch meat with a ten foot pole when I was younger. Now I’m eating meatballs on their own. It only took 28 years. Let’s see how much longer it’ll take me to like meatloaf. One option for this recipe is to make fresh pesto. It will obviously taste amazing, because fresh basil dude, but sometimes (most times) we just buy a jar of pesto. Pesto from Costco, anyone? 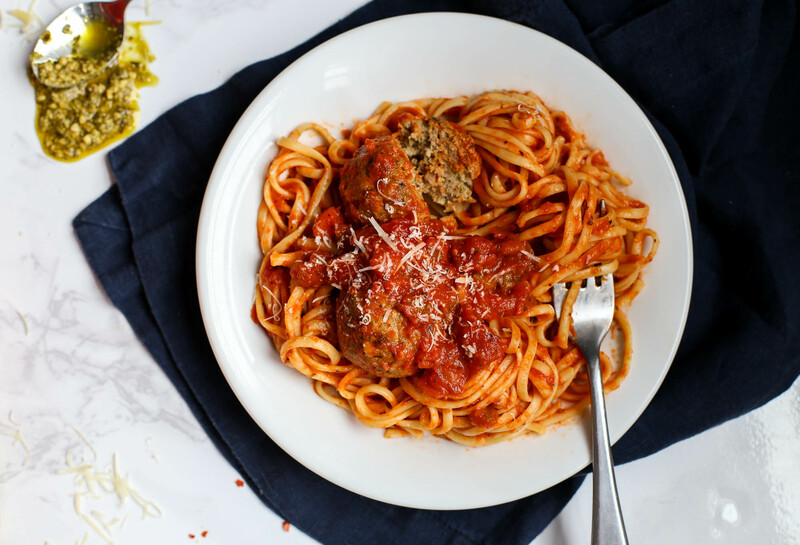 And since we use the oven method, this is one meatball recipe that doesn’t require an entire day of simmering (an Italian grandmother just cringed somewhere) and it makes a great, quick meal for weeknights. You can probably get at least two meals out of it, or freeze the leftovers. Unless you have like seven sons or something. In which case I’m sorry, there probably won’t be leftovers. Enjoy! Preheat the oven to 375 degrees F. Line a rimmed baking sheet with aluminum foil. Spray a wire rack with cooking spray and place on the baking sheet. Mix together all of the ingredients in a large bowl and stir well to combine. Roll the mixture into balls. Place the meatballs on the wire rack. Baking for 20-25 minutes, turning once, until cooked through. While you are waiting, you have the option of making the spaghetti and tomato sauce. Prepare the spaghetti according to package directions. Heat the tomato sauce in a very large pot. Once the meatballs are done cooking, add as many meatballs to the sauce as desired. Serve over cooked spaghetti and top with Parmesan. Use a cookie scoop or ice cream scoop to form the meatballs quickly and easily.